Auburn School has much to be thankful for this past month! We are excited to be recognized once again as a Distinguished School by the Kentucky Department of Education because of the hard work our students, faculty, staff, parents and families put in every day! Auburn’s elementary school is ranked in the 95th percentile statewide, and the middle school in the 96th percentile. Auburn’s PTO had a super successful Tiger Family Fun Night, with games, bounce houses, food from the Cattlemen’s Association and Gigi’s Cupcakes, and a live auction. Fun was had by all who attended! Funds generated from Tiger Family Fun Night support school programs and our classroom teachers, allowing them to purchase books and other needed materials for students. A special thanks to all of our community members and sponsors who donated time and goods for the festival and auction baskets. Fourth grade teaches Cindy Beason, Georgia Bryson, Elizabeth Dye, and Jamie Metcalfe would like to thank Logan Aluminum, Barrow Eye Care, Franklin Wal-Mart, and Logan County Animal Clinic for donating funds to purchase a laptop computer for the fourth grade basket. 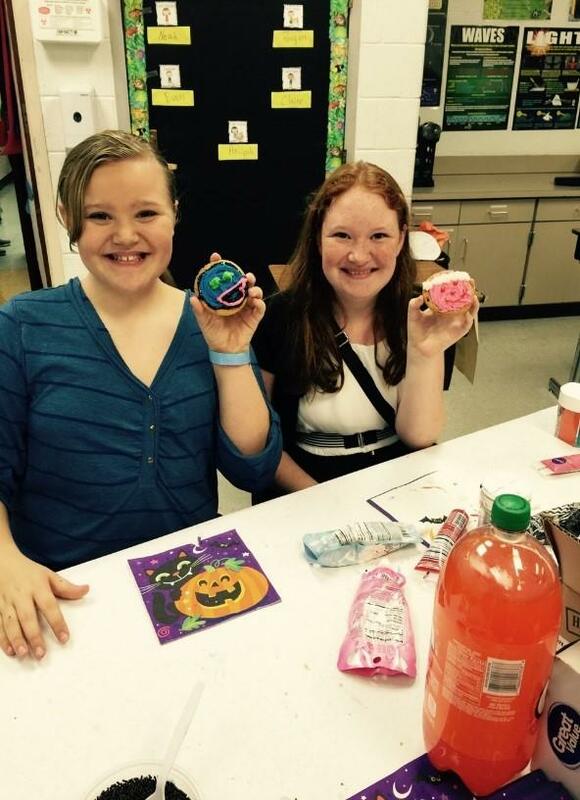 We would also like to thank Brenda Dunway and Kelley Gober from Country Oven Bakery. They donated 43 cakes and 120 cookies for our cake walk and cookie decorating booths for the festival. Auburn has welcomed several visitors and guest speakers recently. Over 20 Logan County High School JROTC students, with instructors Joseph Brockman and Mike Triplett visited the 8th grade class on Nov. 16 to share information and opportunities with the JRTOC program. Two WKU students from WKU visited Beth Stinson’s sixth grade science classroom to share nutrition and exercise facts. Students took a pretest to see what they knew about healthy food choices and physical activity. The WKU students did a short lesson on balanced meals and snacks and how to be physically active by finding activities you enjoy. 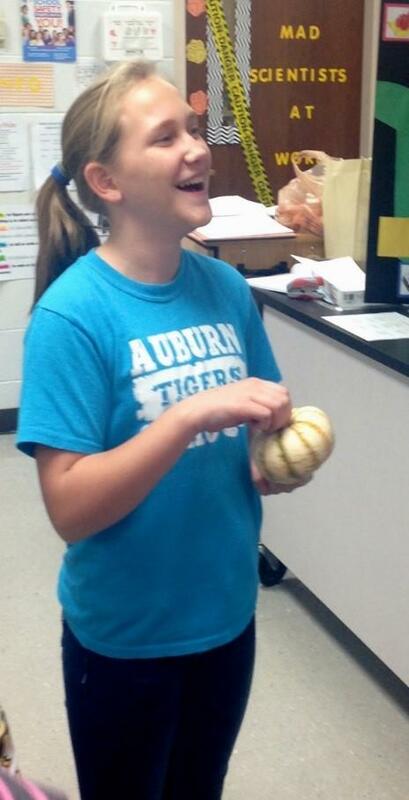 To review, students split into two groups to play a round of hot potato, or in this case, they used a pumpkin. When the music stopped whoever was left holding the pumpkin was out of the game, but first they had to answer a review question. This continued until everyone had a chance to answer a question. The WKU students ended by giving each student a nutritious snack of a granola bar and a mandarin orange. Congratulations to first grader Collin Jackson, who has learned 1000 sight words, and fourth grader Madison Sisk, who recently completed the Lexia Core5 Reading program! We would also like to congratulate middle school band students who recently auditioned to be part of the All-District Band. Seventh graders Lindsey Brinkley, Brianna Brooks, Will Clark, Colton Watkins, and alternate Kellie Proctor, and eighth graders Ashlynn Canler, Penelope Coles, Christian Hines, and Aaliyah Townsend were all selected to be part of the band. Congratulations on all your hard work! Volunteer Spotlight: We are so thankful for volunteer Kim Decker, who volunteers full days in Mrs. Stephanie Wheeldon’s first grade class! 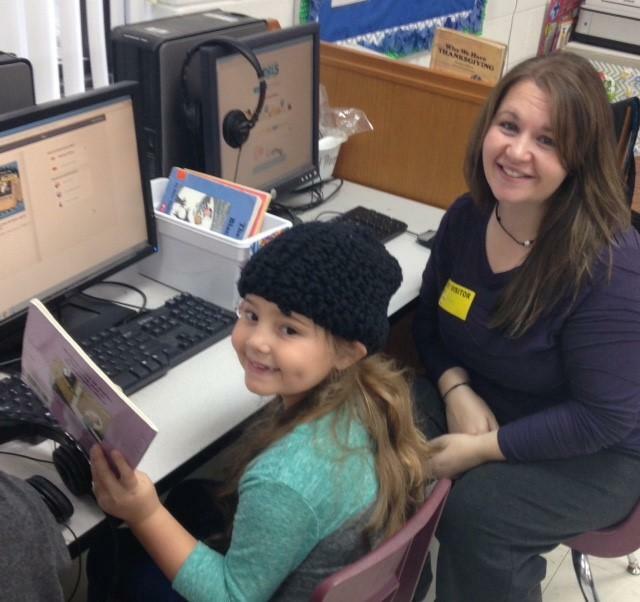 She reads with and listens to student individually to assist them in reaching their reading goals. Mrs. Decker is also helping to coordinate Auburn’s Weekly Spirit Shop! The Spirit Shop will be run by Leadership Club students with Mrs. Decker’s assistance in the cafeteria each Friday from 10:30 to 1:00. Students and parents may purchase Tiger Spirit Gear at that time. Right now, we have popcorn megaphones, shakers, and rally towels for sale. We hope to continue to add an assortment of items throughout the basketball season so you can show your Tiger Spirt at ballgames. Is your Auburn student doing something noteworthy? Please send information (photos are also welcome!) to Sarah Hatton at Auburn Elementary School at sarah.hatton@logan.kyschools.us. We would love to recognize as many students as possible in future articles.